There are times where it seems your cat gets up for the day- just to take another nap. The truth is, your cat isn’t being lazy they just have a very different set of sleeping patterns compared to humans. In an evolutionary light, cats as predators needed a lot of energy to stalk and hunt down their prey. That being said, they also need a lot of energy in order to do so. The term “cat nap” comes from the fact that you can find cats taking 15-30 minute naps- just enough to get their energy back up and run round the house. They tend to be most active at day break and sundown, which is why so many cat owners experience weird wake up calls. This isn’t to say that your cat is always sound asleep, either. They have a mode of rest where they just sort of doze off and enter a light sleep. However, when they are in this state, they are still able to quickly snap out of it and become alert once more. Generally you can tell the difference if your cat is laying or sitting somewhat upward with their ears potentially twitching and following sounds around them. This is a time where they process a lot of information and even “catalogue” input such as smells. It’s a lot like how humans will process the day’s events in their mind as they sleep. In order to tell if your cat is in a deep sleep, they are usually curled up in a ball with their eyes tightly shut. This is the time that your cat may dream- you can tell if their whiskers or paws start to twitch. 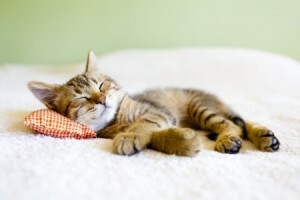 This deep sleep is important for regeneration of the body and the overall health of your cat. 30-40% of a cat’s sleep will consist of this deep sleep, although older cats may indulge in this more often. Did you know that cats can snore as well? Just like with humans it will depend on the individual cat, but it is a possibility. Snoring happens when your kitty’s airway is obstructed by extra skin, which is most likely to happen when your cat is relaxed. It is also more common in short nosed breeds, such as Persian, Himalayan or Exotic Shorthair cats. If you find that your cat has suddenly changed its sleeping patterns, it might be a sign that they are not feeling well. Take them to your vet if you become concerned. For any more questions about your cat’s sleeping patterns and how our cat townhouses might play into this, contact The Cats Inn today! Why Do Cats Like to Be Up High?